The majority of workplace injuries are caused by slips, trips and falls. Depending on the severity of the accident in question, consequences can range from minor bruises to hospitalisation and even death. 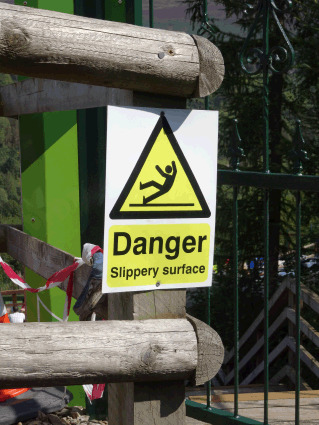 With this in mind, it is crucial for employers to do all they can to prevent slips and falls. We at Label Source sell a range of fall prevention signs that should be used to identify potential hazards and minimise the risk of accidents. Our signs can also be used when working at height - many people are killed every year because employers fail to observe the government's height safety regulations and put the correct fall prevention measures in place. We sell warning signs for all of the hazards mentioned above; whether you're cleaning a floor or working on a construction or excavation site, Label Source's trip hazard sign range will help you and all those around you to stay safe from slips and falls. To purchase your fall prevention sign(s), please select a product from the list below. Risk of tripping symbol safety sign. Caution, Mind the step symbol and text safety sign. Caution, Mind the drop symbol and text safety sign. Caution Slippery surface when wet symbol and text safety sign. Caution Uneven floor surface symbol and text safety sign. Danger, Deep excavation symbol and text safety sign. Risk of slipping symbol safety sign. Caution, Floor cleaning in progress symbol and text safety sign. Caution, Slippery surface symbol and text safety sign. Caution, Wet floor symbol and text safety sign. Caution Trip hazard symbol and text safety sign. Caution, Deep water symbol and text safety sign. Caution Mind the step, mini safety sign. Caution Slippery surface, mini safety sign. Slippery when wet text and symbol sign. Preventing, slips, trips and falls guide. If you have any questions about our fall prevention products, please contact us and we will do whatever we can to assist you.